I don’t like to waste a good snowfall. 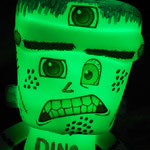 When we got that blizzard last night, I knew I’d spend today turning snow into icy hot Dino Drac content. And I did. I’d preemptively Googled for “things to do with snow” (that was literally my search string), ultimately locating an eHow tutorial about changing snow’s colors. I know this is reading as it’s fiction, but I swear, I really am that interesting. Fast forward to this morning. I was armed. 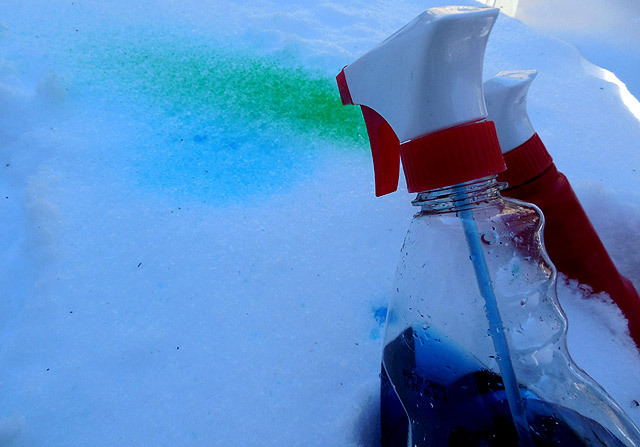 Using a spray bottle that once held glass cleaner and another that once held spot remover, I marched into that tundra with full tanks of green and blue Snow Paint™. 1. I’m a big baby in the cold. I tell people that I’m unnaturally susceptible to it, but that’s not true. I’m just a baby. Even something as glorious as a monster snowman isn’t enough to lure me down a path guaranteed to be rife with cold-hand-pain. Cold-hand-pain is the WORST. 2. This was attractive snow, but it didn’t pack well. The wet snow acted like dry sand, and it took spit, prayer and animal sacrifice to even get as far as that photo shows. 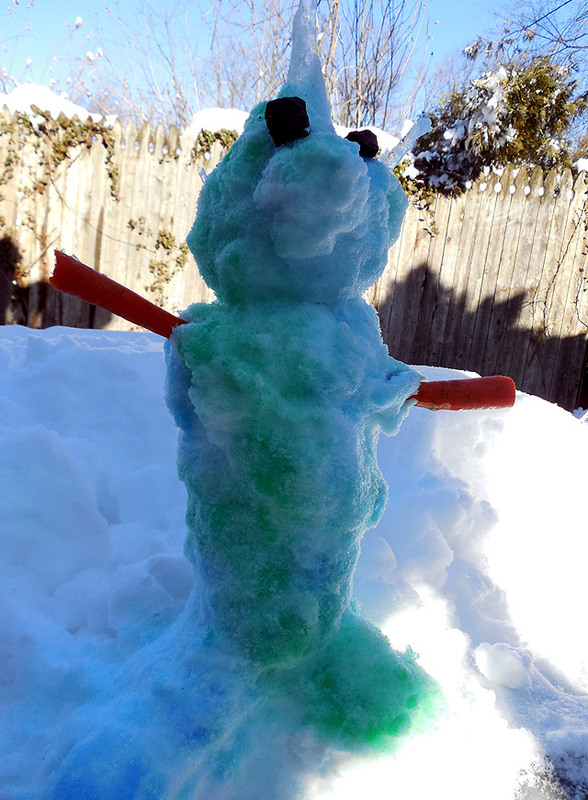 My Snowmonster looks like a busted fire hydrant covered in a sick dog’s green piss, but it’s not because I didn’t try hard enough. Even still, there are some plainly visible kernels of my grand ideas. Notice the icicle spikes? I wanted him to be covered with those. I also wanted the carrot arms to end in what I guess we could term “snow paws,” with fingers made from additional, smaller icicles. There. That’s what I wanted to build. 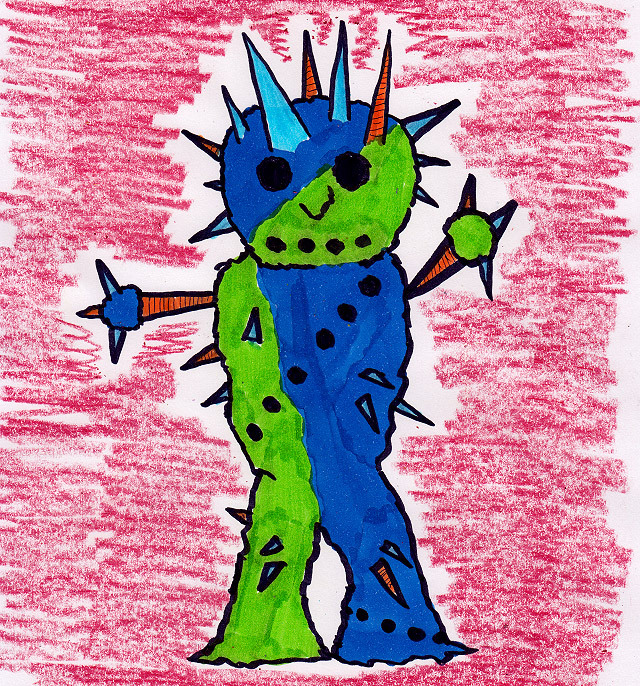 A five-foot doom warrior. A creature cursed to cause pain no matter how gently it tried to touch you. 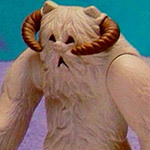 A tragic monster with a Chewbacca-style bandolier, for some reason. EDIT: It’s been pointed out that he sorta looks like Spikor from MOTU. I guess he does. Now I can’t copyright without issue. Oh, and the red background? 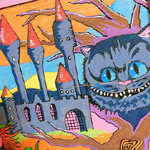 That was drawn with a crayon called “Big Dip O’ Ruby.” I promised myself I’d mention that, but now I can’t remember why. You know, now that I compare the result to the concept, I think I actually like the result better. It’s more abstract. It leaves you with more to think about. It effortlessly straddles the line between fun and frightening. Above all else, it only took 37 seconds to build. That thing I drew with markers would’ve taken hours, and “hours” sounds like an open invitation for an entire legion of cold-hand-pain. Yes, yes. 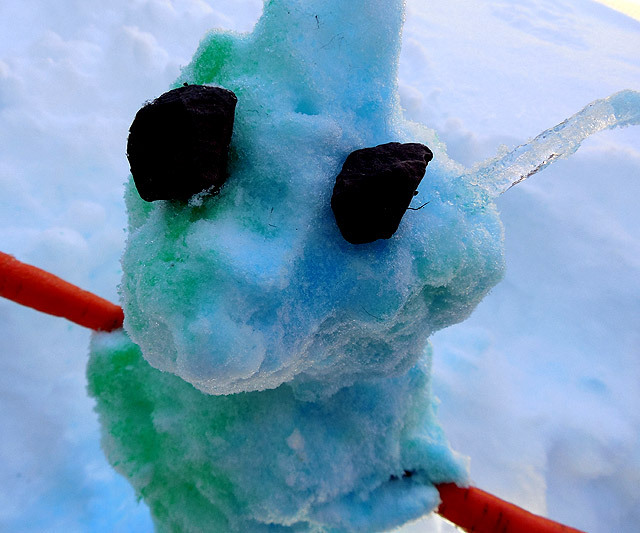 I am happy with my Snowmonster. 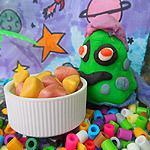 He’s multicolored, and his arms are carrots. He’s Norman Rockwell meets Tim Burton. It’s the idiot’s version of cryogenic freezing. 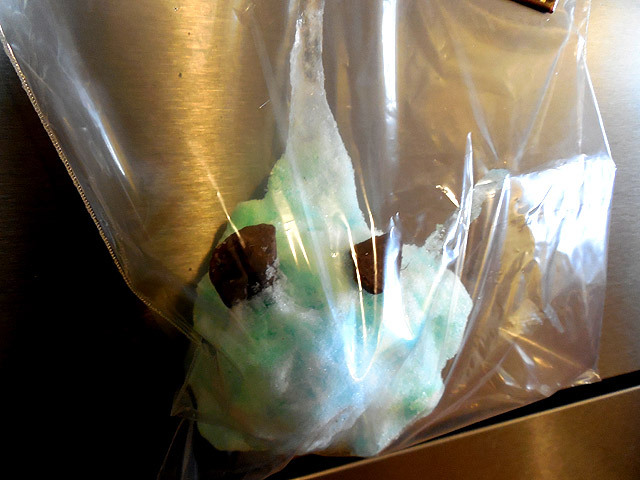 Snowmonster’s head will forever be safe in my freezer. Even under the scorching scrutiny of June, I’ll be able to visit him, talk to him, and maybe ignore him when I just want ice cream. Conclusion: I watched Darkman this afternoon. It’s still pretty good! 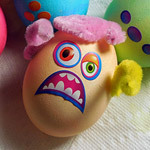 Paas Mini-Monsters Easter Egg Kit!